My inspiration for this tablescape was this plum colored tablecloth and my new chicken statue. I was inspired by the colors in this tablecloth-the deep plum background, the olive green which works well in my home, a pinch of clay white, turquoise, golds and rusts! It had all the right fall ingredients! I found these new clay white dishes at Cracker Barrel on clearance. I was lucky enough to get 6 dinner plates. 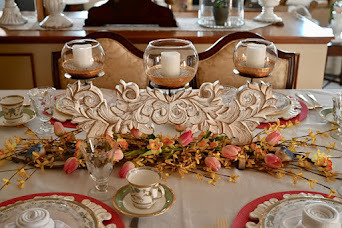 I used my Pier 1 Import salad plates to layer with and the ivory handled flatware is from Horchow called Sophia. And my gold colored napkins seemed to be the best pick to unify the look! These are the only two bread and butter plates they had left- I just loved the designs on these. I found the candle votives at Pottery Barn and since they were done with the chicken wire I had to have them! 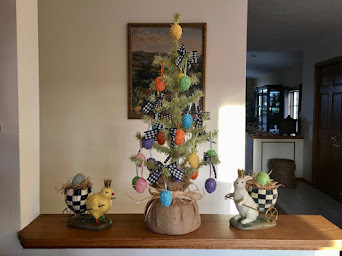 Last year I purchased a few pieces from the Pottery Barn Chicken Wire group, so I knew these were mine the minute I saw them! I took apart a silk sunflower and used them to line the bottom of the glass votive inside the chicken wire. The green color of the votive seemed to be disappearing on the dark tablecloth so I decided they needed something to make them pop! *See my e-mail at the bottom of this post. Early evening is settling in and I have lit the candles. The green pressed glass dessert pieces were something I found on line at Dillards. They reminded me of glassware from the early 70's and I liked the swirly vine design they have. The chicken was elevated on a square woven basket and I added a little embellishment with some silk sunflowers. I was intrigued with the textural design on the plates and the chicken wire and how well they worked together! 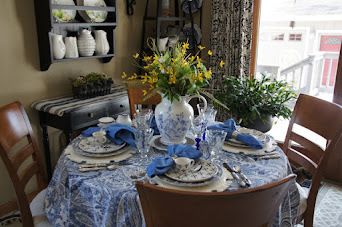 Thanks for stopping by and I hope you enjoyed the elements of my tablescape! 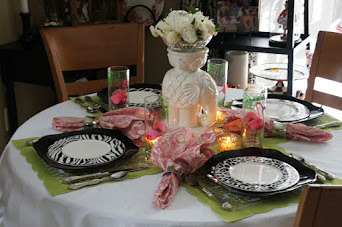 Please check out all the other tablescapes that are a part of this linky party! Posted by Lizabeth Labels: Epicurious , Horchow , One King's Lane , Pottery Barn. 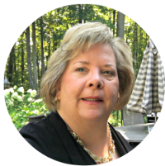 I love your new post Liz. 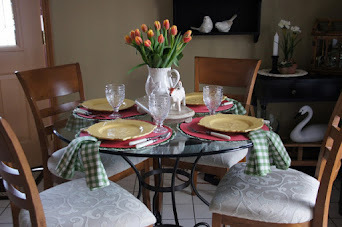 Liz, your tablescape is beautiful and full of color! I love the freen footed bowls! Really pretty! Liz how warm and beautiful this looks. I adore the pretty plum color and the chicken is fab. Hi Liz! I love that table cloth too, it was great inspiration. Pretty dishes too. Love your Roo! Your tablescape is beautiful, Liz. The table cloth has the loveliest colors, and your new white dishes are just gorgeous! New dishes!!! Are you getting funny looks when you bring them home??? It's just beautiful !!! I love the recipe too! Liz that table cloth is to die for I love the colors of fall and the dishes are so charming! The rooster is very stately Love roosters! This is beautiful, Liz! When I saw the title of the post I was hoping plum would be one of the included colors. It is so pretty, but fairly elusive when shopping for it. The gold color napkins are the perfect choice to pick up that color in the tablecloth design! I didn't know that Cracker Barrel had dishes and such. There is one about 20 miles from our home. I'll have to check them out. Let me know if you want me to get more bread & butter plates to complete your set if they have them. Very clever to pull apart the faux sunflower and put the petals around the votives!!! VERY clever! This is a wonderful fall table! The plums and violets really work well for fall, don't they? What a great find on those dishes!! I love them, I always forget about Cracker Barrel because I don't have one close by. You are very clever to put the sunflower in your votive, and you're right, I love how the plate and votive designs compliment each other. I usually check out the items on One King's Lane, don't recall ever seeing your chicken, but he's a cutie. Hope you're doing ok, great job with your 'scape!! That is one amazing chicken! I love these colors together, and your find at Cracker Barrel are a true treasure! Thank you so much for sharing your beautiful table! Love the tablecloth and the chicken wire votives! The plates are so lovely. The whole table gives me a warm homey feel. Thanks for sharing it. Thank you also for stopping by and leaving a sweet comment. I am back just to say thank you for all the sweet comments! And I am glad you enjoyed Elaine's Wonderful World! The table looks fantastic. Great shots too. Liz, I found your blog from Life with Linda. Love this tablescape!! So pretty! I just love looking at pretty tables. 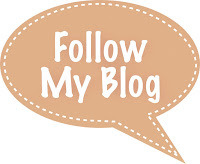 I am your newest follower and I hope you will follow me too. Peace and blessings. You've coordinated it all beautifully, Liz, and the colors and textures are rich and inviting. The chicken statue and wire votive holders add nice touches of whimsy to your cleverly-executed design. Nicely done! Oh how pretty -- love your color combinations -- so perfect for fall. Cute chicken too! Love your Tablescape for fall Liz. I came back to thank you so much for your sweet comments on my new black and white Tablescape. I hope you have a great week. Lovely tablescape Liz. I love the nplates. I have admired them for quite some time now. Tablescaping is so addictive. We can get carried away. Your new ivory flatware is gorgeous and so versatile. the candlelight is so pretty.